I don’t care what the Supreme Court says. Tomatoes are fruits, even if I do agree I’ve never had one for dessert. I also learned that Valium is an all natural chemical, and that trace amounts can be found in wheat and potatoes. Maybe that explains why McDonald’s french fries are so addictive. 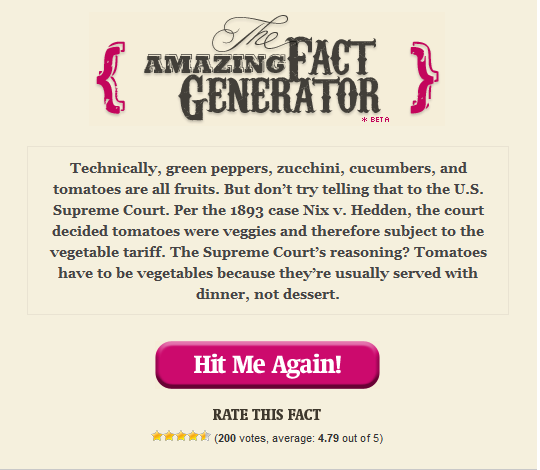 Warning: Do not open The Amazing Fact Generator at work, or you will be hitting it again…and again…and again. Thanks again, StumbleUpon. Good times.